Does the humanitarian system have the capacity and vision to respond effectively to the crises of today, tomorrow, and deep into the future? This report analyses the failings of the system and the resulting widespread malaise in the humanitarian community. It contains an in-depth analysis of past crises, of the humanitarian landscape of today, and of what this tells us about the system’s ability to adapt in order to respond to future, uncertain, and potentially much greater challenges. The report concludes that the humanitarian enterprise, as presently structured, is in deeper crisis than is generally acknowledged by the “powers that be”—the oligopoly of western donors, major UN agencies, and large NGOs that define how the system functions. This enterprise is the world’s safety net and provides essential services to the survivors of conflict and crisis but there are huge gaps and inefficiencies. Much of what is provided is dictated by political calculus rather than rational assessment of need. The system is “stuck in the eternal present” and ill-equipped to deal with emerging and potentially civilization-threatening events. Moreover, despite its claim to universality, it remains very much northern and western in its modus operandi. More can and should be done to ensure that the assistance and protection needs of close to 100 million vulnerable people are addressed in a principled and effective way. 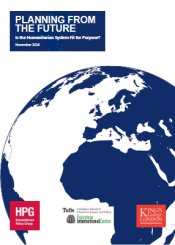 The report includes detailed recommendations for both “quick wins” that, given the political will, could be implemented relatively rapidly and for a “system overhaul” that is crucial to addressing the humanitarian implications of the crises of today and, more importantly, those of the coming generations. The report is the final output of the Planning from the Future project, an 18-month research endeavor conducted by King’s College London, the Feinstein International Center, and the Humanitarian Policy Group at the Overseas Development Institute. In addition to the final report, supporting research papers and case studies can be accessed on the Planning from the Future website.